A group of 5 republican representatives wants to reintroduce the expired and failed Assault Weapons Ban of 1994. So what's the problem? Why do normal people need these weapons? What is wrong with this particular laws, and gun laws in general? We keep seeing calls for "reasonable restrictions" on guns--Always MORE laws than we have now, never removing some of the current unreasonable ones. These rules are more often than not broader than their titles would suggest. Fairly often a non-gun person just doesn't understand the details, or has been actively mislead. Sometimes a law is minor, doing little to either fight misuse or to inconvenience gun owners--but it is one more chip at the foundation. 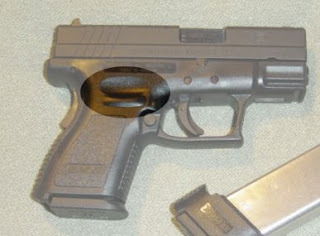 An example: This is a picture of a Springfield Armory XD-40, a handgun in the $450-500 range. The highlighted area is a critical feature of the gun, according to the Gun Control Act of 1968. Based on a law theoretically designed to combat Saturday Night Specials, this particular gun would not be eligible to be imported to the US if this feature were removed. The critical feature? A thumb rest. Makes the grip a "target grip", worth 5 points on the silly points system used to determine the "quality" of an imported handgun, and giving this particular model just enough points. OK, what about registration? Is it OK if the government lets you have most guns, as long as you let them know what you have? Gun owners mostly believe that the second amendment is an individual right, allowing ordinary people to own at least semiautomatic versions of infantry weapons, and that the primary purpose is to make tyranny harder. Some think we will need to rise up against the tyrant soon, others (me among them) think that as long as we have the ability to rise up, we will never need to. This leads to the conclusion that before a government can become too tyrannical, it is necessary to disarm the citizens. Even if the disarming is done with the best of intentions by a currently benevolent government, it makes a later tyrant more likely. Registration is a necessary first step before prohibition. Prohibition isn't (quite) an inevitable result, but it is a common one--First registration is required for a certain type of gun, then no more are allowed to be sold. Finally, the existing ones are banned, and the registered owners are contacted to give theirs up. The people wanting to ban all guns shift their efforts on the "worst" of whatever is left. Criminals aren't going to register their guns, so what legitimate government purpose is served by registration? As a result, most pro-gun activists are against registration, whether explicit or back door. Back-door registration is a system that claims to have some other purpose, but requires registration--Microstamping, eliminating the "gun show loophole", some parts of "safe storage" laws all require registration. The "gun show loophole"--The loophole is that the rules at a gun show are exactly the same as anywhere else--Dealers still have to do background checks, just the same as if they are at their store. In most states, this means that private owners can sell to each other without paperwork. Many of the proposals to end the "loophole" require all gun sales to go through a dealer--This will add $20 or so in cost to every private sale, as well as ensuring that there are records of who owns what. Gun shows are not a significant source of criminal guns. Criminals rarely buy their guns from ANY legitimate source--Instead they are stolen, or the criminal convinces someone with a clean record to purchase for them, known as a "straw sale". "One gun per month" laws are meant to combat straw sales--but also require records to be kept. Safe storage laws put the liability for a stolen gun on the listed owner. These are often accompanied by a requirement that stolen guns are reported shortly after the theft. Enforcement requires registration. Almost all gun owners will report stolen guns as soon as they are discovered. How do the authorities tell the difference between an unreported theft and an unreported (but legal) sale? These laws may also make it difficult or impossible to legally have a gun ready to defend a household. New York and Maryland both have a requirement to submit a fired cartridge from each new gun to be included in a database. This has been in effect for 7 and 8 years respectively. The data has been used in just one conviction in Maryland, with allegations that the case was already solved before the database was consulted specifically so there would be a "solved case". New York has yet to use the database in a conviction. It doesn't do any good to know that a particular gun was used in a crime without a way to cross-reference to an owner. Micro-stamping means that the firearm must be designed to imprint a coded serial number on each ejected cartridge. To be effective, this requires registration. It also complicates manufacture--not all designs are amenable to micro-stamping, and it is trivial to defeat with simple hand tools. So far, micro-stamping is a patented technology, and it is unknown what the licensing terms will be, or if the terms will be evenly applied to all. Ammo serialization means that each bullet and cartridge is marked with a number unique to that box of ammo, and sellers would have to record who a particular box of ammo was sold to. Some versions of these laws would require all non-serialized ammo to be destroyed within a certain time period. This would significantly increase the cost of most ammunition-more than likely .22 ammunition would more than double in price. Buying from a dealer requires a NICS background check and ID. It is a felony to lie on the 2273 form, and the form asks you questions that determine if you are elegible. Even this law is mostly wasted--Less than 1% of failed background checks result in a law enforcement investigation and arrest. Either the background check is rejecting innocent people, or not enough people are being arrested. If we aren't going to use the laws we have consistently, do we really need more? I enjoy your writing very much. It's extremely clear. Even though I have a strong distrust and dislike of the government, I find your statement about tyranny a bit unrealistic. To state that the guns in America are the only thing preventing a tyrant from rising up, to me sounds paranoid and self-aggrandizing (take no offense please). Mainly what I'm thinking is the law-abiding gun owners and their 200,000,000 or so guns feed the criminals. This happens in several ways. Guns are transferred with no paper work to bad guys. Guns are stolen often by family members. And a small percentage of good guys go bad with addiction, alcoholism, depression or just good old crime. What do you think is the original intent of the second amendment, written by people who had just revolted against a government they felt was tyrannical? Luckily, guns are NOT the only thing that stands between us and tyranny. Rather, they are held in reserve as the last desperate defense against a tyrant when all else has failed, and as a deterrent to the tyrant fully realizing his plans. What are the percentages of crime guns sourced via the "gun show loophole"? Do you have a problem with law abiding gun owners selling to each other without paperwork? I think that is a problem. If we allow paperless transactions to occur, how can we know that the receiving party is one of the good guys. What about a background check for anybody and everybody? I would say that's a common sense approach that need not involve registering what guns each person owns, only that each person is eligible to own them. How's that sound? Depending on details, and if it were a compromise also giving gun owners something I would probably agree. What we gain would not have to be big, and I think the most appropriate one would be to put handguns under the same residency rules as rifles. That would mean as long as a sale was legal in both states, it wold be legal according to federal law. If the purpose of a gun law is to combat crime, why do such laws target the people who have no criminal intent? Target the criminals. Otherwise, such 'good intention' gun laws only serve to disarm and harrass the law-abiding, ironically, creating an environment more conducive to crime. Every gun law is unconstitutional. Paying a fee, filling out a form, getting a license, begging for permission, or clicking my heels together three times are all infringements on a Right that, by our Supreme Law, shall not be infringed. My personal view, having sworn to support and defend the Constitution against all enemies, foreign and domestic, is that the enemies of the Constitution can pass all the unconstitutional laws they want to. I simply won't comply with them. If armed men are sent to force compliance, I go to war.